"A Lodge is a certain number of Masons duly assembled, legally constituted, having the Holy Bible, Square and Compasses, with a Charter or Warrant, empowering them to work." "To the Most Worshipful Grand Lodge of the State of Massachusetts. "That for the convenience of their respective dwellings, and for other good reasons, they are desirous of forming a new Lodge, in the Town of Winchendon, to be named Artisan Lodge. They therefore pray for letters of Dispensation, or Warrant of Constitution, to empower them to assemble as a legal Lodge, to discharge the duties of Masonry in a regular and constitutional manner, according to the original forms of the order, and the regulations of the Grand Lodge. "They have nominated and do recommend Brother John G. Folsom to be the first Master, Brother Francis W. White to be the first Senior Warden, and Brother Wilder P. Clark to be the first Junior Warden of said Lodge. If the prayer of the petition shall be granted, they promise a strict conformity to all the Constitutions, Laws and Regulations of the Grand Lodge." Signers were: Joel Parker, Loring Chase, William C. Nichols, Francis W. White, George O. Hubbard, Wilder P. Clark, L. J. Wilkinson, Charles H. Ingalls, Edwin Sawtelle, Joseph C. Long, Aloric A. Boyce, Harry Pitkin, Alvah Godding, Williain Y. Stanley, Daniel Harvey, George W. Chandler, Charles E. Lake, W. H. Coffin, K. S. Porter, D. F: Hall, John G. Folsom, A. A. Ballou, W. N. White, Arthur Boucher, Harvey Wyman, Herman Daniels, Stephen Fitts, Dan C. Robinson and C. F. Bemis. "empowering the signers to form and open a Lodge, and to admit and make Freemasons, according to the ancient customs, and not otherwise. This Dispensation to continue in full force from date of issue until the regular, quarterly communication of the Grand Lodge in the month of September, 1866, unless sooner revoked. Attest: Charles W. Moore, Grand Secretary." At this meeting three Brothers were appointed to act as Committee on By-laws. It was voted to hold regular meetings Friday evening on or before the full moon, at 7 P.M. from September to April, 7:30 April to September. After this first meeting it must have been a very busy year, for up to and including the 1st of September, 1866, there is a record of no fewer than forty-eight meetings, nearly one each week. Finances appeared to be the great topic of discussion, and means were devised to raise funds to carry on the work and pay bills. Degree fees of $40.00 were voted, and several petitions were received during this first year. August 25, 1866, By-laws were adopted, patterned largely after those of Aurora Lodge of Fitchburg, after which the committee was discharged. January 26, 1866, a Holy Bible was presented for the Altar by Mr. Nelson D. White. Mr. White was given a vote of thanks by the Lodge, and it was also voted to have the Bible suitably inscribed. On September 12, 1866, a Charter was granted to Artisan Lodge, signed by Most Worshipful Charles C. Dame, Grand Master with the following sixteen Charter members' Joel Parker, Harvey Wyman, William Y. Stanley, John G. Folsom, D. F. Hall, Geo. O. Hubbard, Hary Pitkin, Loring Chase, Francis W. White, W. P. Clark, Edwin Sawtelle, L. J. Wilkenson, Charles E. Lake, A. A. Ballou, W. N.White and Daniel Harvey. John G. Folsom was elected the first Master and on October 19, 1866, Most Worshipful Charles C. Dame and suite consecrated the new Masonic Hall and installed the officers. Artisan Lodge continued to hold its meetings in the Baptist church for neaily two years, to Decembet 1867, as the last recorded rent bill for those quarters was approved and ordered paid in March 1868, when a ten year lease of quarters on the top floor of the First National Bank building was signed. It is interesting to note in the records that a bill, in addition to rental, of $19.00 for warming for six months, to July 1, 1868, caused so much discussion that a committee was appointed by the Worshipful Master to consult with the bank concerning it. Regular meetings were'held monthly in the new Lodge-rooms in the bank building until September 20, 1921, when the present Lodge-rooms were first occupied at a special meeting held for the official visit of the D.D.G.M. Regular meetings are held on the first Tuesday of each month with the exception of July and August, when the Lodge recesses. Meeting dates have been changed a number of times during the 75 years of the Lodge's existence. The October meeting is the annual meeting. October 17, 1916, Artisan Lodge observed the 50th year of its existence by appropriate exercises in the Town Hall. The feature of this observation was the official visit by Most Worshipful Melvin M. Johnson, Grand Master of Masons in Massachusetts, and suite. The addresses of note were given by the Grand Master, M. W. Melvin M. Johnson; by the Grand Secretary, R. W. Frederick W. Hamilton, and the Historical address by Wor. Charles D. Young. April 23, 1869, a Past Master's Jewel was presented Worshipful John G. Folsom. At his death this was presented to Artisan Lodge with the request that it be presented to the presiding Master at the Lodge Centennial. There have been 42 presiding Masters of.Artisan Lodge and at present 16 are living and members. During this 75 year period nearly 400 have received the degrees as conferred by Artisan Lodge, and at the present time 144 are enrolled as members. This membership has naturally varied according to periods of prosperity or depression. At its peak Artisan Lodge had a membership of 169, and like all Masonic bodies, this includes representative men from all walks of life. Following is a list of the Masters of Artisan Lodge for years ending Aug. 31st. (number of members in the lodge is in parentheses). This in a brief manner brings to your attention some of the interesting details of the growth and development of Artisan Lodge. Of necessity it is largely statistical and no attempt can be made to go into any detail regarding events of interest only to Artisan Lodge. May Artisan Lodge continue to prosper and hold its prominent place in the Town of Winchendon is the message of Louis K. Cross, Historian. HISTORY OF ARTISAN LODGE, A. F. & A. M.
On Thursday evening, December 1, 1864, thirteen Masons assembled in the hall of the Winchendon Baptist Church to lay the ground work for Masonry in Winchendon. From amongst them, they chose John G, Folsom and Alphonse A. Ballou as Moderator and Secretary-Treasurer, respectively, and voted to hold weekly meetings for the purpose of lecturing and offering instruction in Masonry, Two weeks later, on December 15th, they named their organization the Winchendon Masonic Association, and set annual donations at one dollar. Thus began the first active Masonic organization in the Town of Winchendon, Massachusetts. These thirteen Brethren, duly recognized afterward by the Grand Lodge of Massachusetts as the Founding Brothers of Artisan Lodge (September 12, 1866), included Brothers Alphonse A. Ballou, George W. Chandler, Loring Chase, Cpwdry, John G. Folsom, D, F. Hall, Daniel Harvey, George 0. Hubbard, Charles E. Lake, William C. Nichols, Edwin Sawtelle, L. J. Wilkinson and Harry Wyman. Lodge records indicate they met together weekly, often receiving instruction from Brethren visiting from Lodges in Gardner, Fitchburg, Groton and other nearby communities. At their March 25, 1865, meeting they approved a motion to raise $500.00 to be used to defray costs of establishing a regular Masonic Lodge in Winchendon, Two-thirds of that sura was pledged that evening. It was also agreed that the Winchendon Masonic Association would rent the Baptist Church Hall for one year under what must have been very liberal terms; for, records from the next several meetings detail substantial renovations on "Mason's Hall," as it soon came to be called. The name "Artisan Lodge" was approved unanimously on March 30, 1865, although it appears six members abstained and later tried to have the name changed. Ten days later, the newly-elected officers worked the First Degree on William H. Coffin, the first candidate for membership to Artisan Lodge. To the Most Worshipful Grand Lodge of the State of Massachusetts. That for the convenience of their respective dwellings, and for other good reasons, they are desirous of forming a new Lodge, in the Town of Winchendon, to be named Artisan Lodge. They therefore-pray for letters of Dispensation, or Warrant of Constitution, to empower them to assemble as a legal Lodge, to discharge the duties of Masonry in a regular and constitutional manner, according to the original forums of the order, and the regulations of the Grand Lodge. They have nominated, and do recommend, Brother John G, Polsom to be the first Master, Brother Francis W. White to be the first Senior Warden, and Brother Wilder P. Clark to be the first Junior Warden of said Lodge. If the prayer of the petition shall be granted, they promise a strict conformity to all the constitutions, laws and regulations of the Grand Lodge. Interest in Artisan Lodge had grown substantially in the preceding months as attested by the addition of nineteen names, to the previous thirteen, listed on the petition above and which follow: Joel Parker, Sonig Case, Charles H. Rugalls, Joseph C. Long, Alarie A. Boyce, Harry Pitkin, Alvah Godding, William J. Stanley, W. H. Coffin, K. S. Porter, F. W. White, Arthur Boucher, W. N. White, Herman Daniels, Stephen Fitts, C. F. Bemis, Dan C. Robinson, Wilder P. Clark and S. J. Wilkinson. A Dispensation was approved and granted by M. W. Parkman to be in effect until the next regular communication of Grand Lodge in September 1866. The By-Laws were accepted by the Lodge on September 29, 1865. Dues were continued at one dollar per annum although special assessments of up to $10.00 per member were voted at various times to meet particular needs. The fee for the degrees was set at $40.00 and the regular monthly meeting established for the Friday evening on or before the full moon; the annual meeting was declared to be in October. On February 23, 1866, Mr. Nelson D. White presented the Lodge Its first Bible which was in continuous use until the spring of 1980 when R. W. Celian H. Abbott presented the lovely Bible, square and compasses which adorn the altar today. No fewer than forty-eight meetings were held under the granted Dispensation. When Grand Lodge reconvened on September 12, 1866, a regular Charter was granted Artisan Lodge by M. W. Charles C. Dame. One month later (October 19, 1866), M. W. Dame and his suite dedicatee the Masonic Hall and formally installed the duly elected officers of Artisan Lodge. Meetings were held in the Baptist Church until January 25, 1867, when newer and more spacious rooms were acquired in the First National Bank building. These facilities were utilized until 1921 when, on September 20th, new rooms were secured in the former Bart Block, a building on Central Street just then purchased by Artisan Realty, Inc. The decade beginning in 1920 saw the most vigorous growth in the history of the Lodge. Annual returns show an increase of sixty-three members by the end of 1930, achieving the highest number of members (169) in the history of the Lodge. Depression and war in the ensuing years reversed this pattern of growth until membership stabilized in the early 1950's. The past two years have been, in at least two respects, the most successful in Lodge history. Men have sought admission into Masonry through Artisan Lodge in almost unprecedented numbers (only in the year 1919 did the Lodge gain more members (23) than in 1980). More significantly, and the reason we have come together tonight, Artisan Lodge designed, built and now occupies its own Masonic facilities. Incorporation papers were taken out in May 1976 (approved March 2, 1978), for the establishment of the Winchendon Masonic Charitable and Educational Society. The first meeting of the Incorporators was held on March 14, 1978, with all subscribers present. R. W. Raymond J. McLean was elected Chairman and Wor. John A. Davis, Clerk. 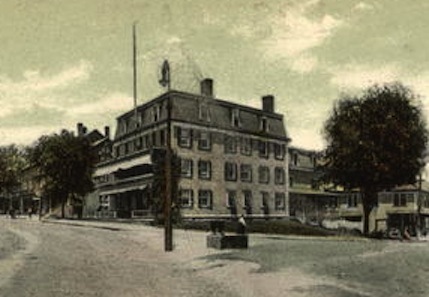 The primary purpose for which the corporation was formed was to accept the very generous gift by Brother Edwin H. Merrill of ten acres of land upon which to erect a suitable building to serve as a Masonic Temple in the Town of Winchendon. In addition to the aforementioned, incorporators included Duncan H. Burns, Duncan H. Burns, Jr., Henry L. Doody, Ernest. P. Fletcher, Jr., Richard A. Godfrey, Edward M. King, F. Richard Ladeau, William P. Lawrence, Bruce C, Lemire, Arthur E. Marsh, Raymond J. McConnell, Edwin H. Merrill, Kenneth L. Norcross, Sherman S. Paris, Ottmar Rau, Frank J. Rota, Burton K. Sawtelle, John A. Squitiero and Francis Wing. In March 1979 Brother Duncan H. Burns was elected President of the Board of Trustees of the corporation. Brothers J. Albert Gauthier and Richard A. Godfrey were selected as Secretary-Clerk and Treasurer respectively. Worshipful Ottmar Rau, Wor. Burton Sawtelle and Bro. J. Thomas Engle were appointed as a committee to raise funds for the erection of the new Temple. Under the leadership of Brother Burns, and through the generosity and help of many - members, wives, family and friends alike, the Temple in which we sit this evening was raised. and Trustees Celian H. Abbott, Duncan H. Burns, Jr., J. Albert Gauthier, Morris A, Gibbons, III, Arthur A. Marsh, Burton K. Sawtelle, Edwin H. Merrill - Honorary and Ottmar Rau, ex officio. The Brothers of Artisan Lodge are deeply gratified to have M. W. Arthur H. Melanson, Grand Master of Masons in Massachusetts and his suite join us in the dedication of our new Temple on this 19th day of September 1980. This auspicious occasion will lay the groundwork for another 115 years of prosperity for Masonry in the Town of Winchendon, Massachusetts. A new Masonic Lodge, under this name, was consecrated and its officers installed by M. W. Grand Master Dame, assisted by officers of the Grand Lodge, on Friday evening, 19th of October. The Ceremonies were performed in the Lodge room in one of the meeting-houses of the town, — the consecration at four o'clock, and the installation of officers at six o'clock. The installation was public, and the Lodge room was partially occupied by the ladies of the members. The ceremonies were conducted by the Grand Master in his usual correct and admirable manner, and were of a highly interesting character. At the conclusion of the ceremonies, the Grand Master addressed the Master, Wardens, and brethren, briefly and beautifully, in regard to their new position, their duties and responsibilities. John G. Folsom, W. M.
Francis W. White, S. W.
Webster P. Clark, J. W.
Leonidas J. Wilkinson, S. D.
Charles E. Lake, J. D.
Harrison A. Crocker, S. S.
George S. Loud, J. S.
In the evening, the officers and members of the new Lodge, with their wives and guests, sat down to an elegantly spread supper at the American Hotel, and had a most enjoyable time up to the hour of 11 o'clock. At the conclusion of the feast, speeches were made by Grand Master Dame, R. W. Brs. C. W. Moore, J. W. Dadmun, William Sutton, S. G. W., Wm. W. Wheildon, J. G. W. pro tem, L. L. Tarbell, Grand Marshal pro tem, E. D. Bancroft, Grand Lecturer; E. F. Gray, G. T., Rev. Mr. Wheeler, Mr. J. Murdock, and others, the Master of Artisan Lodge, Br. Folsom, presiding. The speaking during the evening was uncommonly excellent, and commanded that close attention of the company, so that for more than two hours not a person left the room. The members of Artisan Lodge, with their wives and invited guests, held a sociable in Masonic Hall, on Monday evening, April 16th. The occasion was a re-dedication of the hall, which the brethren have taken a great deal of pains in re-furnishing. The additions made are, six settees, two on each side, and two on the west end of the hall, twelve officers' and three principal cliairs, an altar and three pedestals. The furniture is all of black walnut, of elegant design, and nicely upholstered in terry. The top of the altar is upholstered in the same, and the top of the pedestals are covered with a nice marble slab. The top of the altar opens with hinges like a trunk, and the inside forms a receptacle for the three Great Lights, Gavels, Batons, etc. There will also be added a cabinet desk for the Secretary, made of black walnut, to match the other fixtures. The brethren of the lodge were heartily congratulated by the M. W. Grand Master for their zeal and successful efforts in refitting and furnishing their pleasant Masonic home. A Special Communication of Artisan Lodge was held on Saturday, Sept. 30 in the Masonic Temple on School Street, Winchendon, with the lodge opening at 6:00 p.m., followed by a banquet served at Hidden Hills restaurant in Rindge, NH at 6:00 p.m.
At 8:00 p.m., M. W. Albert T. Ames, Grand Master of Masons in Massachusetts was received with an accompanying suite for the purpose of Rededicating the Masonic Temple. A fine turnout of brethren and guests was in attendance to witness the formal ceremony. The Grand Master and guests were received by Wor. R. Clifford Lupien, Master of the Lodge. This page was last modified on 19 October 2017, at 20:22.